Bundled by B&H for your convenience, the Ibanez SR305E SR Standard Series Electric Bass Starter Kit provides everything you'd need to get started playing a five-string electric bass in an amplified manner. 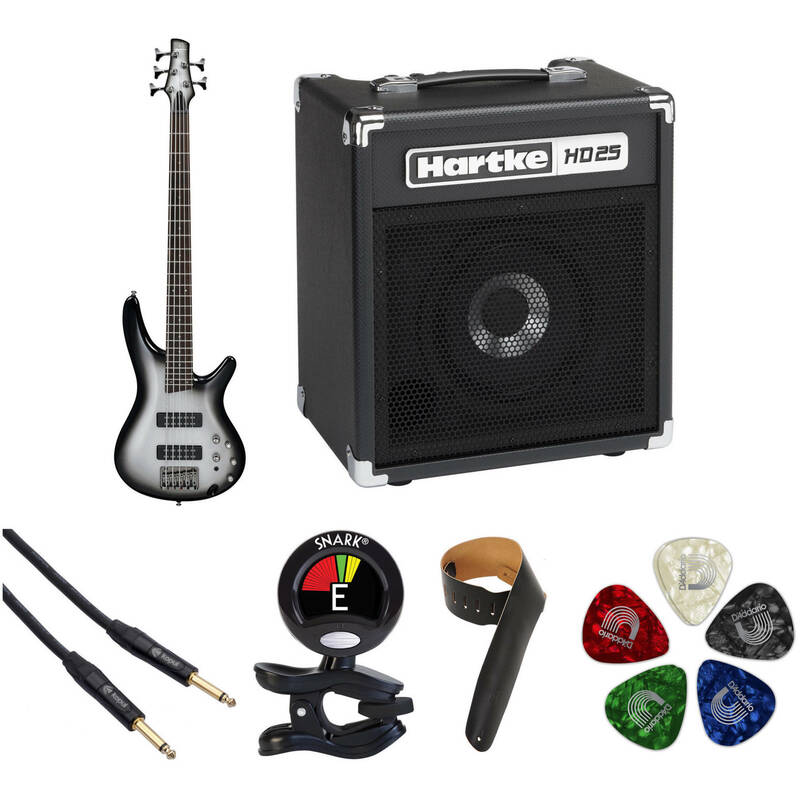 The kit comprises a Hartke HD25 25W 1x8" combo amplifier, a strap, a clip-on tuner, an assortment of picks (should your fingers tire, or should you want more attack), and—let's not forget—a five-string electric bass in the SR305E. This instrument features a bolt-on five-piece maple neck, a solid mahogany body, a rosewood fingerboard, a three-band EQ with a power tap switch, and a metallic silver sunburst finish. Additionally, an instrument cable has been provided for connecting your instrument to the amplifier, ensuring that in its totality, this kit will provide a solid baseline for all of your extra-low bass lines. The SR Standard Series SR305E from Ibanez is a modern 5-string electric bass featuring a mahogany body in metallic silver sunburst finish. Its bolt-on SR5 5-piece maple/rosewood neck is fitted with a 24-fret rosewood fingerboard which has white dot inlays. The solid double-cutaway body delivers maximum resonance and sustain, while the SR4 neck is smooth and fast, providing unlimited playability for the most demanding player. Intended for electric bass, the HD25 from Hartke is a combo amplifier capable of delivering 25W RMS. Its 1x8" cabinet houses a 10" bass speaker. After connecting your instrument to its 1/4" jack, you can manipulate the signal with bass, mid-range, and treble controls. The amplifier gives you a headphone output, the use of which mutes the amplifier, and thus, enables you to practice silently through headphones. A 1/8" line-level input allows you to plug in CD players, MP3 players, or any compatible playback device, giving you the opportunity to practice along with a background track of your choice. A top carry handle allows you to carry the amplifier combo around. This unit is suitable for use in rehearsal spaces and practice sessions. The 10' Premium Performance Instrument Cable 1/4" Male to 1/4" Male with Braided Fabric Jacket from Kopul is designed for connecting guitars to amplifiers or any other application where a 1/4" instrument or unbalanced line-level connection is required. It can be used in applications for live stage, theater, rehearsals, recordings, and more. Kopul's 3000B Series instrument cables are engineered for protection against electromagnetic interference (EMI), radio frequency interference (RFI), and the significant reduction of static noise. This cable features gold-plated 1/4" connectors that have a metal shell and chuck-style strain relief. A braided fabric jacket prevents unwanted tangling and adds durability to the cable. The 24-gauge annealed-copper conductors with dense spiral copper shielding, as well as a conductive PVC, and PE insulation make the Premium Performance 3000B Series instrument cable with braided fabric jacket, a flexible, quiet cable that ensures excellent transfer of the audio signal. The black Snark SN5X is a clip-on tuner for guitar, bass, and violin, which features a high-sensitivity vibration sensor and a full-color display that rotates 360°. It can be used to tune a guitar, a bass or a violin for applications such as rehearsals, recordings, live stage, theater, and more. The tuner can be utilized on either the front or the back of a head-stock to accommodate left or right handed players. Styled in black, the M4-BLK from Levy's Leathers is a leather strap for electric bass players who wish to perform on their instrument whilst standing upright. It also provides a measure of support for your bass when you're sitting down. The strap itself measures 3.5" wide, and can extend from 36 to 52". This 10-pack assortment of medium Classic Pearl Celluloid Guitar Picks from Planet Waves is made from premium celluloid and provides a natural feel and fat tone. The standard size and shape of the picks, at 0.70mm thick, offer comfortable playing. A man-made material, celluloid was first introduced in the early 1900's as a substitute for natural tortoiseshell picks. The D'Addario-branded pick packaging is designed for minimal waste and environmental impact. Box Dimensions (LxWxH) 48.0 x 18.5 x 4.0"
Box Dimensions (LxWxH) 19.1 x 17.6 x 13.5"
Box Dimensions (LxWxH) 6.1 x 0.3 x 0.2"
Box Dimensions (LxWxH) 3.7 x 2.7 x 1.7"
Box Dimensions (LxWxH) 2.8 x 1.3 x 0.3"